Words Done Write: Please RT? Please bite me! There's no quicker way to make me shake my head and move on than to write "Please RT" at the end of a tweet. Now, if you are a nonprofit organization trying to raise awareness about an issue, you are the exception. I have no qualms with people spreading philanthropic messages or asking for a retweet to help a worthy cause, either. But, for you regular Joes who write "Plz RT" when you share your own content (e.g. blog post, podcast, video, etc. ), you make my eye twitch. Twitter is a happy place for me; it's me time. Time where I'm calling the shots, tweeting what I find interesting, and sharing with the community. If I find something worthwhile, you bet I'll retweet it. If I want to support someone I like, you can count on me to share their content. But the "Plz RT" after a tweet turns me off. It feels desperate and demanding all at the same time. If you have retweetable stuff and a targeted audience, it'll get retweeted. It's a beautifully simple process. Sure, alright, sometimes good things won't get retweeted. It happens. But, asking for a retweet just rubs me the wrong way. Sometimes, people even take the request to the next level by asking via direct message. "Hey Amber! Will you RT my blog post on colors for the nursery that make your baby poop less?" No, no I won't. If this person knew anything about me they'd realize that's not what I tweet about. My Twitter stream is fairly targeted and focuses on business, writing, social media, and related topics. Not childcare. If I don't RT your post, it doesn't mean I don't like you. But, frankly, I'm a little annoyed about being asked to do something which clearly illustrates you don't know me. Identify your audience and find people who care about baby poop. As for putting "Please RT" in a tweet, yes I know it isn't a crime. Nobody dies. No one even gets kicked in the shin. But, it's not something I'm going to respond to. You get retweets by producing good content, establishing relationships with those in your Twitter stream, creating a targeted following, and building a good reputation for knowing your stuff. Not by asking for favors from strangers. Do you find the "Plz RT" thing a little self-absorbed or am I in this boat all alone? "You get retweets by producing good content, establishing relationships with those in your Twitter stream, creating a targeted following, and building a good reputation for knowing your stuff." Earlier today, I had a conversation w/ a colleague about how so many folks seem so hellbent on making online marketing sooooo much more complicated than it really needs to be. Reading this post, I can't help thinking that the folks you describe here are the other side of the same coin - with both groups (the "get ranked quick" gurus & the RT pleader-moochers) eternally searching for a way to game the system instead of investing the time & effort to build a real presence, make real connections & provide something of value to folks who want or need it. From a broader cultural perspective, I'm thinking these are the same folks who buy (and sell) financial pyramid schemes and "Lose 30 lbs in a 30 Days Eating Pizza & Ice Cream" diet plans. Why waste your time on "eat less, exercise more" or "spend less, save more" when the guy on the teevee says he has the secret that'll make you thin & rich by a week from next Sunday? While there are many sins a writer can commit, failing to respect one's readers has to rank pretty high on the list. And ultimately I think that's what's most irksome about the serial "pls RT" contingent. They don't respect their own words enough to think they can stand & be valued on their merits, & they don't respect their Twitter connections enough to refrain from trying to co-opt them for personal or professional gain. I'm with you, Amber; it rubs me up the wrong way If I think a tweet is interesting/useful/funny/relevant, I WILL RT it - I don't need to be asked. If the writer does say "Please RT", I won't. Amber, very well said. There are no shortcuts in life nor should there be in blogging. You want RTs? Write good stuff  Put it out on your various social media platforms (several times throughout the day because your friends/followers aren't online 24/7)  Hope whatever audience finds it will think enough of it to RT  Repeat for your next blog post. Contrary to what some people might believe, I think promoting your blog post repeatedly (4-6 times/day) ALONG WITH your own replies AND RTs of other peoples stuff will give your audience the best chance of finding your post which will either lead to an RT or not. If after effectively promoting your blog post(s) over the course of several days, you find very few comments or RTs, you might want to consider another hobby. Writing ain't for everyone (regardless of what the "social media marketing gurus" will tell you). Hey Kay, thanks for weighing in. I'm with you. If someone asks me to RT their stuff, I won't. I won't even open the link. I just hate that approach. Thanks for the comment, Dan! You're so right. There are no shortcuts. Making others responsible for your success is lazy! Please RT? Puuuuhlezzz. As for those "social media marketing gurus", they generally just reinforce bad practices, don't they? I love, love, love this comment, Hugh! Thanks so much for taking the time to share such thoughtful insight. I think I hear the angry ninjas at the door now! You're so right, Hugh. From the pyramid schemers to the ice cream dieters, people need to start being responsible for their own success. There is no quick way to meet your goal without your own blood, sweat, and tears. Don't put the work on others. Own it! You're just spot on, Hugh. Hard work, quality, and respect is the recipe for success. Thanks so much for chiming in and adding such good input to the discussion here. All right, I'm a little late, but I told you I'd get here! This post cracked me up, because asking someone to retweet so often defeats the point of the retweet option. It's supposed to be a matter of sharing what YOU think is important, not a shameless marketing technique. 2) It's a time-restricted event happening in real life that your followers would be interested in, but can't wait until next month to find out about. 3) Ummm...wait...it'll come to me. Hi Renee, thanks so much for chiming in! Always great to hear other people's take on things. As I mentioned in the post, I'm with ya on #1. For sure. As for #2, honestly, I doubt I'd use the "please RT". As you say, it's a matter of sharing what YOU think is important.The jury will have to say out on #3, huh? Oh you're not alone! I hate that and I HATE the DMs from people you never talk to who ask you to tweet something for them. I'm convinced, even, some people have set up auto DMs every time they publish a post. I'm with you. Bite me. Considering I am adding a new comment in response to your request, "Add New Comment," and directly above are other requests in the form of a tweet button and like/dislike buttons, and over on the right is a request to "follow this blog" with Google Friend Connect, and other requests to subscribe to your blog with a reader or via email, followed by a request to follow you on Twitter, et cetera, do you really want to know how I feel about you asking people to not request their tweet be retweeted? AMEN SISTER!!! YOU ARE NOT ALONE! Thanks so much for stopping by and adding your thoughts to the our little dialogue! I will only RT if I have developed a 'relationship' (I might be easy, but I do have some standards.........). But like you said, most w/ legitimacy will not be asking and they are connected enough the RT will be a given. There is a lot of junk out there and I try to be sensitive to the fact people are actually trying to make a living doing this, but there really needs to be a person and personality involved or you won't have my attention long. Well, Bill. When you put it in terms of money, I'll always comply. One of my favorite things to say. (I actually have lots of favorite things to say) is Stop telling me what to do! If I want to RT, I'll do so because I want to. I'm less likely to do so if you asked, in fact. And I agree with your exception - if it is cause-related, or something of a serious incident that we can all help by passing on a message, that's fine. Glad to have found another kindred spirit, Lisa! I'm totally with ya! If it's a plea for help, I'm all over that. Earthquake victims? A lost dog? I'm your girl! But if someone asks me to retweet their new Animoto slide show? Pass. If I said "Plz RT" regarding this post would you hold it against me? I can't help it, it's too good not to re-tweet! You are DEFINITELY not alone! :) And I completely agree about charity/nonprofit/philanthropic etc things. Just to add - same thing on FB:"please like my page", "please share my post"... Get away from me people! If I like it I'll rt/share/like it, if I don't what's the use of irritating people with unnecessary borring pleas? I'm with you, Branka! All the incessant begging. And Heaven forbid you're connected to such a person on multiple platforms and get bombarded with all those requests. Bleck! My timeline shows no such thing. Granted I follow relatively few people (and am followed by less) but I have come across some people who think it's acceptable to add such a request. Some people I've unfollowed did that. I didn't unfollow necessarily because of the plz RT request but this is one symptom of many unsavoury Twitter characteristics that will soon surface, if not already. I did the plz RT myself, though. Usually of the more important things like what I have for lunch. I'll add hashtag too, like #important. LOL, my followers are very patient like that. No, you're not alone. 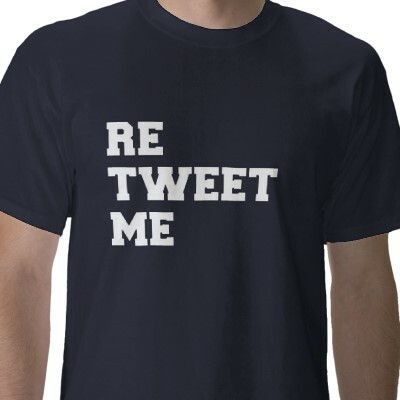 Asking others to retweet reflects the assumption that one's tweets are more worthy than others. IOW, self-absorbed & egocentric. I have never asked anyone to RT. Ever. Thanks for chiming in, Shirley! I also think, however, that there are some people who aren't self absorbed; they're just clueless. The kind that would be shocked that someone found their "Pls RT" offensive in some way. Thanks for adding to the discussion, Bobbcat! I had someone ask for a retweet on a kitten trapped in a tree in a certain suburb, it got retweeted all over and eventually it got rescued! So that was cool. I was all in favour of retweeting that. I hear ya! Something so little, but it truly says a lot, huh? Yay! That's a great story! And a wonderful example of the exception to the "please RT" rule. I'm with you - an RT from me = support agreement and desire to pass on to my stream as "certified by Pedro" so I won't do meaningless RTs. My exception is the help out / emergency ones where we ALL would like to see the message passed on to and read by as many peeps in as short as possible a time. These I'll RT just the once.